Okay, I know most of you are wondering what in the world hemming has to do with genealogy, but bear with me as I guide you through my thought process as I had to re-hem a pair of pants that was manufactured in China. My first thought, like many of yours, was that we can't purchase clothes that are sewn well any more. That inevitably led to thoughts about moving our manufacturing overseas instead of keeping it here in the United States. I began to think about all the children who are being exploited in the Chinese factories and about the empty garment factories that I had seen in Amory while I was there at Christmas. I also thought about the economy and how the garment industry used to employ so many people in the area in which I grew up. My mom even worked in one for awhile way back when. As I thought about how many people are out of jobs right now, I began to wish that those factories were still open and giving employment to people in an area which really needs some jobs. From there, my thoughts went to college. I was in a vocal ensemble when I was in college called "Radiance." We had matching outfits but for some reason the person who was making them was way behind right before our first performance. We had to hem them ourselves. Well, I'd never hemmed anything in my life. By the time I made it around the skirt, I had three legs! Our music professor's wife took pity and tore out the hem and did it herself! I'm pleased to say that my hemming skills have improved since then. It's kind of sad though when you think about the reason they've improved. It's because you can't find clothing today that will hold together once you take it home. I'm always having to mend something. I then began to realize that the rhythm of the stitches was relaxing. I wondered if our ancestral women found sewing to be relaxing or if it was just a chore for them. Then I thought about the invention of the sewing machine. I realized that any time you introduce mechanization into a process that it becomes less relaxing. I'm sure that most of the women by this time viewed sewing as a chore instead of something for relaxation. This led to thoughts about genealogy in general. As we have more and more electronic tools -- databases, Word processors, spreadsheets, online sources, etc. available to us are we also letting the quality of our research slip? Do we start relying on online sources and forget that there are things in courthouses, archives, and other repositories that may never make it online? Do we become so intent on making sure we get everything entered and cited that we never make progress when sometimes a written documented summary might do the same thing for us? I know that I have a lot of old data that still needs to be entered into my genealogical software and documented. However, I have that information available in my files, and I generally know what I've proven and haven't proven. Yes, I need to go back through some of that early research, but I'm not sure that putting it into my genealogical database and citing it is what I need to do as much as creating narratives and timelines where I can spot gaps or things that need further documentation. Have we forgotten how to do the things that bring order to our chaotic electronic world? I'm not saying that we ought to abandon those programs, but I think there is a time and place for them. I've decided not to worry if I don't have everything in my program if I can reach the place I need to reach without the stress of adding it. There are some things that are easier to do with a program. I'll continue to enter and document for those things, but I'm going to be relying a little more on the Word processor and spreadsheet software. I'll have to admit that I still like to do things with pencil and paper, but I also know that it's easier to document when I have the footnote feature available to me in the word processor. I am, however, going back to a few of those old family group sheet forms and putting little numbers in circles for the footnotes and writing those out on the back of the form. There are times that is all I need while sorting people out. We also need to remember that those full image electronic resources we love so much are still derivative works. While I don't think that any of our major vendors are guilty of digital manipulation, it's possible that could happen. I'm especially careful when it comes to digital images on a personal Web sites. It would be pretty easy to "photoshop" a document. We need to get the best source we have available to us to use. Most of the time that means a visit to a state library, archives, or courthouse. Sometimes we still have to use the microfilm which is a derivative, but we can get as close to the original as possible. I guess you can say I'm getting out the needle and thread a little more and not relying on the sewing machine quite as much with my genealogical research these days. The theme for the first January 2009 Carnival of Genealogy is New Year's Resolutions. We're supposed to share some of our genealogical and blogging intentions. I am not one to make resolutions at all. However, I will share a few things on my to-do list. Prepare presentations and meet all deadlines for the 2009 FGS/AGS Conference. I'm doing four presentations. Some of my presentations just need to be revised to meet the audience needs. One is getting a great deal of new content because I'm changing some of the focus. I'll be updating or creating syllabus materials for all of them in the next couple of months so that they are ready when they need them for the conference syllabus. Work on articles for publication. I'm currently researching a problem that will make a great article. I'm also working with another researcher on a project which we hope to publish. I hope to make good progress on both of these in the next year. I had really hoped to do a lot of work on the problem that I was working on over Christmas break, but my mother's health issues altered my plans. I'm running behind. At least I'll get off to a good start on the one by keeping my research trip to the North Carolina State Archives in Raleigh on schedule. I'm not quite as prepared as I would have been had I been able to complete my research in published abstracts in Knoxville before the trip, but I've got a few things to do and can do those now instead of later when my time may be a bit shorter. I do have hopes of completing at least one of these in 2009. Submit proposals for 2010 conference presentations. The only way I may be able to go to NGS in 2010 is if I'm speaking. It falls in the academic year instead of after it as usual. In fact, it will be fairly close to finals. I don't have the tentative academic calendar with me, and I'm not sure if I've seen it or not. It should be either the week before finals or the week of finals though. I'm really sad about that because it is in Salt Lake City, and I really want to go. I don't really hold out a lot of hope for getting an invitation to present at NGS, but I can try. FGS 2010 is in Knoxville so it's "local." Attend NGS, FGS, and regional and local conferences, seminars, and workshops. Besides NGS and FGS, I have the registration form for the North Carolina Genealogical Society's Spring Regional Workshop [PDF] ready to fill out. I usually find at least one worth attending in our area as well. Blog as I find something to blog. I don't like to force posts. There's nothing worse than re-hashing old posts for an entire month. If I don't have something new to say, I just won't say it. I know that I don't like re-reading old posts, and I'm sure my readers don't really want to do that. If a newcomer to my blog comes along, he or she can easily access the old posts through the side links. The posts are there. My blog has never been entirely devoted to genealogy. It's a reflection of my whole person. I've seen other bloggers with multiple blogs for each interest in their life neglect one when they focus on the other. Now I'm sure there are some that manage these successfully, but I am not one of those. I've badly neglected my Mississippi blog since I resigned from USGenWeb a little over fourteen months ago. It probably needs to be buried! I keep hoping to find another blogger with Mississippi genealogical and historical interests to be a co-blogger with me, but it's just not happening. I simply don't have the time to maintain two blogs. Technically I have four, but one is for my class and isn't used much any more except as a demo. The other is our library's, and I'm not the only blogger there although I am the most frequent blogger. I probably won't be making Randy's list of the best of the geneablogs for the week very often because most of the research I'm doing at the moment is intended for publication elsewhere, but I do hope to make it once or twice in the coming year! Bill over at West in New England has given me the Proximidade Award. [Also Denise at Family Curator tagged me.] My biggest question is this: If the recipients of these "are not interested in prizes of self-aggrandizement" why are we continuing to send them on? Why are we even participating when we receive them? I'm honored to receive this award, but I'm really tired of these tagging memes. I much prefer the memes that let people choose whether or not they wish to participate. When most of your blogger friends have already been selected, it's really hard to find anyone left to pass the honor along. 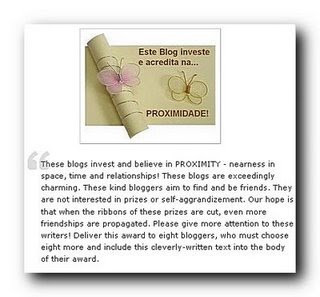 If you are reading this, have your own blog, and haven't been tagged in this meme, consider yourself a Proximidade recipient. Time to go put those clothes in the dryer and another batch in the washer! The Northeast Mississippi Daily Journal had an article in today's paper that told the origins of several north Mississippi towns including Trebloc, Guntown, Aberdeen, Verona, Ashland, Falkner, Oxford, and Tupelo. It also has the meanings of some Native American bodies of water such as the Tallahatchie, the Tombigbee, and the Lappatubby. I read a most interesting article in this morning's Northeast Mississippi Daily Journal about some of the ornament traditions (see below for link to print version; this link is for the stories only) in various families from the area. The newspaper showed a photo of the tree with more than 1200 ornaments on it! That was not the only tree in the home either. I sure would hate to be the one hanging all those ornaments! There were stories of ornaments that were handed down through families, made from old quilts, and even ones made from Happy Meal toys. There was at least one person who shares my habit of purchasing souvenir ornaments from places I have traveled. I began doing this because I simply don't have the space for mugs and such, and it is easier to store ornaments and bring them out when I decorate. As I hang the ornament, I can relive the memories of that trip. I just wanted to share this with my blog readers! The online version (of unedited stories) is quite a bit different than the version that appeared in the print version. Many of you have probably noticed a lack of blogging over the last couple of weeks on my part. I have not had time to blog. My mother entered the hospital on December 3 and was there for 2 weeks. I finished my responsibilities for the semester and after grades were submitted, I left a week earlier than I intended because I was needed. Even before I left, I was busy taking care of many things by phone at a distance. Mom is home now, but Christmas will be different this year. She's still very weak, and she's not quite herself. I'm doing all the cooking for Christmas dinner. I suspect that all of us will experience a wide range of emotions when it comes to how different Christmas is at the family level. However, there is one thing that will remain the same. We would not be celebrating Christmas had it not been for Jesus! I think we've all had a reminder of how dependent we are on Him this year as there has been nothing we can do except pray as we've been dealing with Mom's state of health. I don't know how much time I'll have for blogging over the next week or two, but I'll try to post as I have something to say and have time. Marshall Ramsay's cartoon says it all. For each person listed below, provide the name of the spouse of the person and the genea-blogger to whom they are related. Easy, eh? A bonus question: Who in your ancestry has a very unique name? Tell us - amaze us with the creativity of your ancestors! I think I'll go with Tamasin Ireland, the wife of Rev. Nathan Ward. To be honest, I really don't think of names being unique after years of doing genealogical research. I've not encountered a lot of people with the name "Tamasin" though. Most published sources state that her father was Abraham Ireland. I blogged an interesting story about Abraham over a year ago. I hear that you look a lot like Randy Seaver. If you live in San Diego like he does, you might want to shed that red suit you always wear. It might be a little warm in such a warm climate. You will, however, need it for your trip to East Tennessee if the weather is like today's which included some snow. Our weather seems a little colder than usual, so I just want to make sure that you are prepared for it! I think this is where I'm supposed to say that I've been a good girl this year. However, since the song says that "he knows if you've been bad or good, so be good for goodness sake," that seems a bit redundant. I'll let you make your own assessment! Here is my list of 3 wishes for Christmas. I understand that you only grant heirlooms and not clues to genealogy or current things like journal subscriptions. I have arranged them in order of priority for your convenience. Richard & Agnes Thornton family Bible . I just know that if you'll send this along to me that it will hold the answers to the parentage of both Richard and Agnes among many other important family dates that would have been recorded. Quilt made by Lucy Perkins Dearborn. I would love to have a quilt made by this 3rd great-grandmother. She's one of my New England ancestors that moved to the Midwest. I think an old quilt would be a wonderful heirloom. Medical implements that belonged to Elizabeth "Betsy" Murry Mosely. I think it would be interesting to have some mid-19th century medical implements that belonged to my 3rd great-grandmother. There weren't that many females practicing medicine back then, but the family tradition that she practiced medicine is backed up by census records so I want these implements to treasure. This concludes my wish list for Christmas 2008. I'll skip the part about the snack for Santa. Some would say that you need to go on a diet, but I think you really feed most of those snacks to the reindeer or you'd be gaining far more weight than your pictures reveal. I found this on a blog somewhere out in cyberspace. 1. Wrapping paper or gift bags? BOTH - probably heavier on the gift bags lately. 2. Real tree or Artificial? - Mine is artificial, but I love live ones. I'm just too busy to take care of a live one during the holidays. 3. When do you put up the tree? When I have time. It will go up this weekend this year. Usually a few days earlier. 4. When do you take the tree down? When the cat lets me! I do keep it up until January 6, but if the cat is sitting under it, I will leave it up a little longer. He loves that tree, and I hate to cut his fun short! 5. Do you like eggnog? Yes. Although I usually have mine without the real "nog." 6. Favorite gift received as a child? I don't remember a lot of my childhood gifts, but it was probably a doll of some sorts. I got a cassette player when I was about 10 that I played nonstop for a long time. I really enjoyed that also. 7. Hardest person to buy for? My dad. 8. Easiest person to buy for? Me. 9. Do you have a nativity scene? Yes. It's a small one. 10. Mail or email Christmas cards? Mail. There are just a few traditions worth keeping! 11. Worst Christmas gift you ever received? Probably a really bad fruitcake. 12. Favorite Christmas Movie? I love all the Christmas movies including the perennial favorite "It's a Wonderful Life", but I will be different and admit that I really like "The Bells of St. Mary's." 13. When do you start shopping for Christmas? When I have time. I just purchased my first gift online today. 14. Have you ever recycled a Christmas present? For those white elephant parties, I have. 15. Favorite thing to eat at Christmas? Cheese ball and crackers. I love all Christmas food though. I'm trying to avoid making it because I don't need the calories. 17. Favorite Christmas song? Just one? I guess I'll choose "O Holy Night"
18. Travel at Christmas or stay home? Travel to parents' house. 19. Can you name all of Santa’s reindeer? Of course. 20. Angel on the tree top or a star? Currently an angel, but used to always be a star. When the star broke, all I could find was an angel. 21. Open the presents Christmas Eve or morning? Usually Christmas morning. 22. Most annoying thing about this time of the year? Crowds -- crowded roads, crowded parking lots, crowds in the stores. 23. Favorite ornament theme or color? I have a large collection of music-related ornaments. 24. Favorite for Christmas dinner? We used to always have turkey & ham, but since there have been fewer of us on Christmas day, we often do steak now. 25. What do you want for Christmas this year? I haven't really thought about it yet. I'm not as much into the gift giving and receiving as in the "Reason for the Season." I really want those kids that receive the boxes I packed for "Operation Christmas Child" to have a great holiday. As far as gifts go, I usually end up getting money so I can spend it on whatever. I'll have to see what's on sale for the after-Christmas sales or what I really need. I'm not into buying a lot of extra stuff that will collect dust. It looks like the Grinch really deal steal Christmas.